Millennials are reshaping the world of work through their knowledge of new technologies, work habits, and attitudes of the 21st-century workplace. At the same time, IT departments are working to add flexibility to the way they are supporting the Millennial worker. Yet it’s not just about IT providing the right tools and devices to its employees so they can get their jobs done effectively; IT needs to offer an overall workplace ecosystem that is secure and innovative. 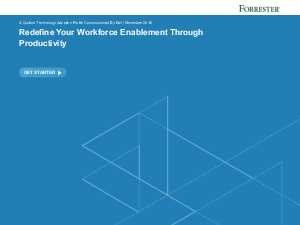 In September 2016, Dell commissioned Forrester Consulting to conduct a study with 560 information workers across all industries in Australia, India, the UK, and the US. Learn more about the working habits that emerged and how IT departments can apply these insights to future deployments. Download Report!